This morning I am greeted with silence, the good kind. There's the hum of the refrigerator, me striking the keyboard and I'm slowly getting ready for what I want to accomplish today. Boring stuff like paying bills. Soon there will be phone calls from my sister and my daughter. Maybe even one from my son. This morning even though it is still humid the air feels different, you know fall like. Whispers of seasonal change-I am more than ready for another season. I want to be cold, see my breath outside and wear a jacket with a scarf and mitts. 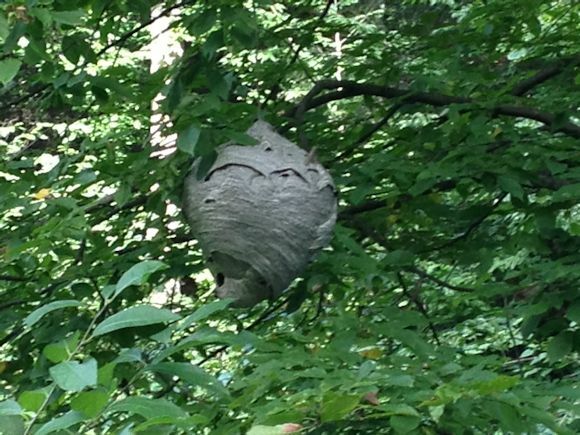 On one of our walks down the dirt road we spied this massive wasp nest. It's quite impressive! My husband took that photo, I was busy staring with my jaw dropped. 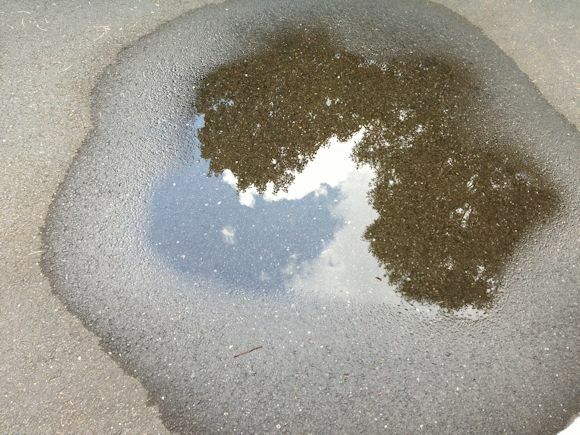 Every few weeks I take a puddle reflection photo for no reason. This is the shawl that with every single stitch I am savoring. Each row is taking over 15 minutes so I know it's going to be a while before it's off the needles. Oh, Karen!!! The shawl! I love the color....I love the pattern....and I know I would love the yarn...it looks heavenly. That is one knit that you can savor....no rush. yummy. That wasp nest is huge!! I opened our patio umbrellas this weekend and there were wasps in both of them trying to built nests. Good thing I caught them before they really got started! 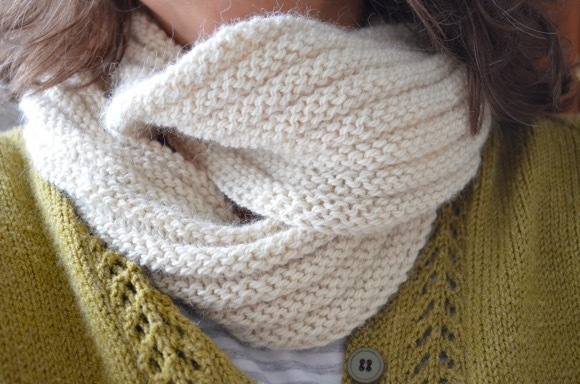 LOVE, love, love the new shawl you are knitting! There is a shift in the air here too and I have already started my yearly praying for snow. I want a really cold winter so I can wear on of my sweater's and knit by the fire. 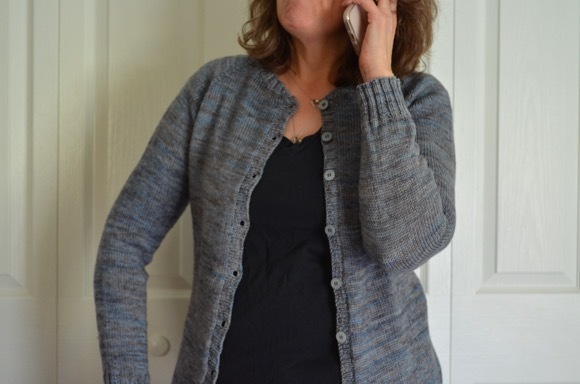 Speaking of knitting, your shawl is amazing Karen. Have you posted about it before and I forgot? What is the pattern? Enjoy each round and have a great Tuesday. Oh, and I hope you hear from your son today too. Amazing photographs Karen, that wasp nest is something else. I can feel that change in the air too. I've just been picking mulberries and tiny green grapes and blackberries...autumn will soon be here. 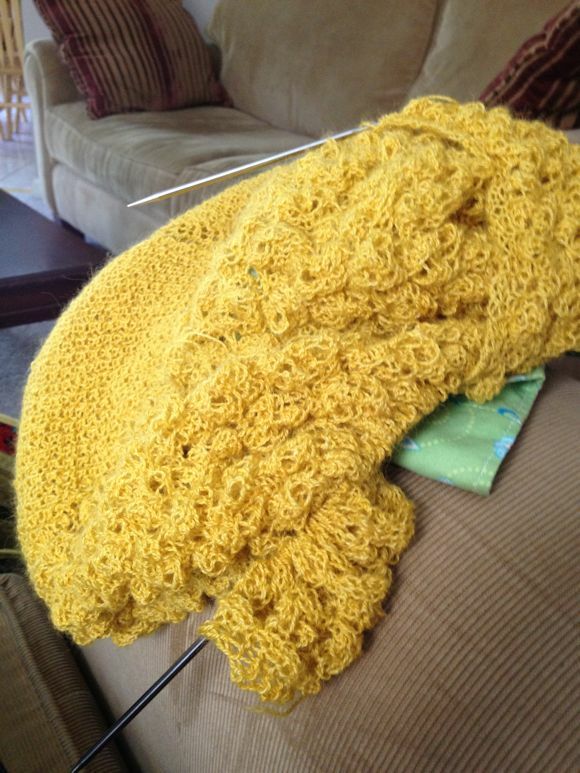 Wow you have so much patience to knit your fifteen minutes rows...It will be a real work of endurance but a lovely sunny colour to work with. I hope you get all your phone calls. I keep getting an email from Hannah every so often as they move to a new country or city...I miss her voice though, and can't wait to see her again...two more weeks to go, back home before she goes off again. i hope the calm continues...happy day. I, too, love this time of the year...those cooler mornings, the shift of the shadows that fall on the kitchen counter, the stillness of the changing of seasons, those blue blue skies with gorgeous billowy clouds! Your shawl is absolutely beautiful! I crochet some, but I admire those who knit! It was fun being here today. Thank you for visiting! Fall is my favorite time of the year ever. I am so ready for Fall! It is my favorite season. I have some new handknits I can't wait to wear. Love the color of your shawl. You can tell the seasons are about to change. It's bittersweet. I love the Fall but I have been enjoying being outside so much this summer. Your shawl is so pretty! And that wasps nest is frightening! I am so ready for Fall, enjoying these mornings before the humidity kicks in. 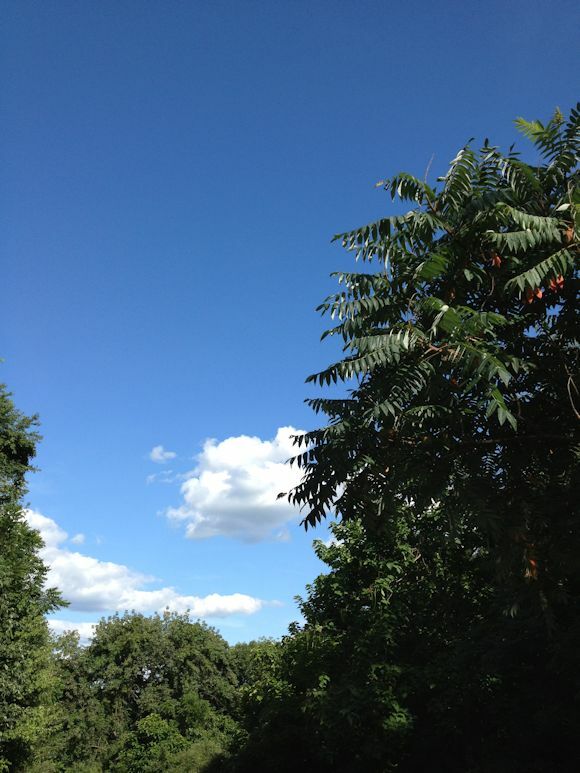 Love your photos from your walk!! Beautiful photos, love the puddle reflection. While I love fall, I am hanging onto summer as long as I can. Your shawl looks so pretty, love that colour. 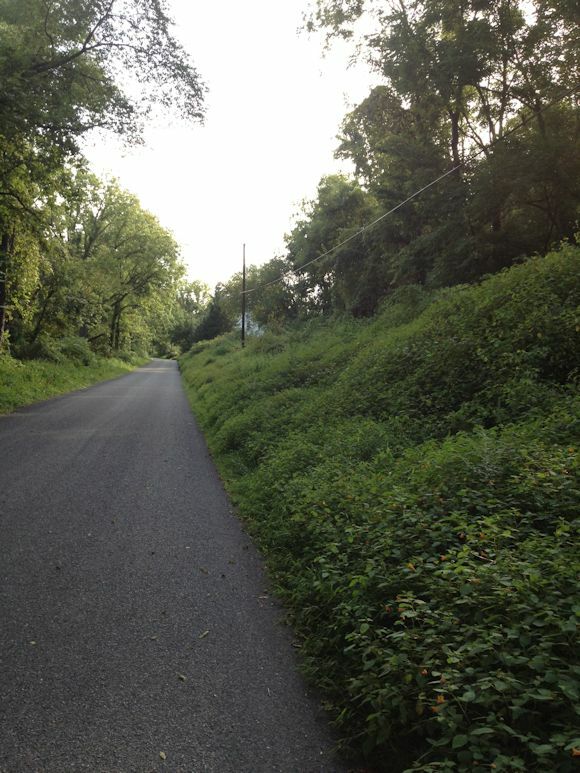 Absolutely love the glorious picture of the narrow country road! Lucky you! I am waiting with a great deal of anticipation for fall..it is my favorite time of year!.....Even more so with the twins coming! Your day sounds lovely and peaceful- Enjoy, enjoy enjoy!!! The wasps nest is a marvel, paper thin layering to make such a solid core and the center of activity for the hive. It is lovely to revel in the silence and be at peace. Great photos, Karen. Wonder how many wasps are housed in that nest? Lovely shawl! I'm on the slow end of one also....lots of stitches!